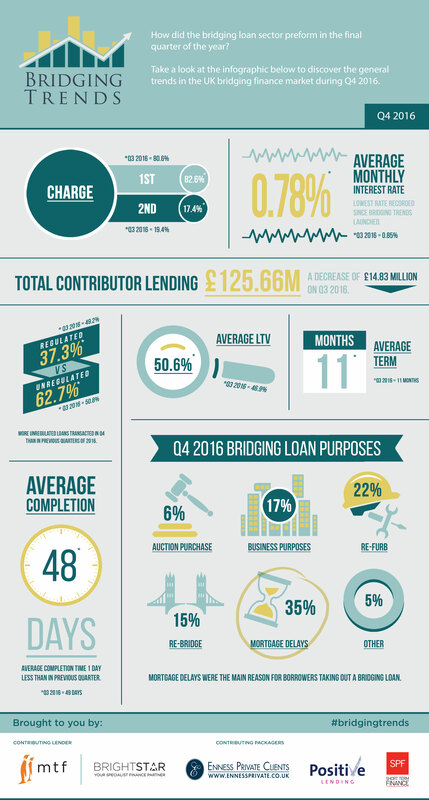 Take a look at the infographic below to see the trends that shaped the bridging finance market in 2016. “The final figures for 2016 show strong demand for bridging loans. Interest rates were again under consistent downward pressure throughout the year, as the bridging sector continued to be highly competitive. “The bridging finance market has been shrouded in uncertainty throughout 2016. Political issues both in the UK and overseas – including Brexit, the US election and the far right gathering ground in Europe – have led to an increase in activity volumes for specialist lenders in our opinion, as lenders outside this space took their time to evaluate the potential impacts, holding back from lending. ““The fall in average monthly interest rates is a reflection of continued increased competition within the industry – however, it would be more beneficial to see greater innovation within the specialist lending sphere, rather than simply keener pricing. “The fall in average monthly interest rates is a reflection of continued increased competition within the industry – however, it would be more beneficial to see greater innovation within the specialist lending sphere, rather than simply keener pricing. “The bridging Trends data for Q4 and across the whole of 2016 shows that the sector remains strong and is still growing, although growth in 2016 slowed when compared to the previous year’s growth. Against a backdrop of political and economic surprises with Brexit, Trump, Stamp Duty and Tax relief changes, this is encouraging. No surprise that average rates have reduced, with increased competition in the sector, lenders have had to drop pricing to remain competitive and keep market share. “SPF Short Term Finance saw an increase of 1st charge regulated bridging transactions completing in Q4, the majority of these being taken out to save an ongoing purchase of a new main residence. Q4 also saw the beginnings of a mini rate war with low loan to value residential bridging rates being cut to new lows: this has continued into Q1 of 2017. However, I think that the results should be split between regulated and non regulated deals. In particular what is the average rate and LTV for non reg business?